FRUGAL REVIEW: Save Up To 65% On Clearance Items At Target! Hi, Thanks for leaving your blog name on my bubble. 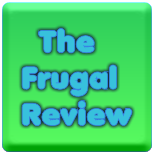 Frugal living is the name of the game in my household. We're trying to get out of debt. I'm clipping coupons like never before! It never occurred to me to check Red Plum online for coupons. (Facepalm!) I've added you to my Google+. Thanks in advance for your help. Happy bubbling, "Pkmom"